"Brazil's independence was not to come from a revolutionary break with the motherland, but from a process which occasioned a few changes from and much continuity with the colonial period. The history of this process begins with the transfer of the Portuguese royal family to Brazil and the opening of Brazilian ports to foreign commerce, which put an end to the colonial system. "The war with Britain which Napoleon was waging in Europe in the beginning of the 19th century ultimately had an impact on the Portuguese crown. Once Napoleon controlled almost all of western Europe, he imposed a commercial blockade between Britain and the continent. Portugal was an opening in the blockade that needed to be closed. In November 1807 French troops crossed into Portugal from Spain and marched toward Lisbon. "Prince Dom João VI had ruled the kingdom as regent since 1792, when his mother Dona Maria was declared insane. He very quickly opted to transfer the entire court to Brazil. Between 25 and 27 November 1807, some 10,000 to 15,000 people set sail for Brazil in Portuguese ships. They were escorted by a British fleet. The entire bureaucratic apparatus headed for the colony: ministers, counselors, Supreme Court justices, Treasury officials, army and navy officers, and members of the high clergy. They took with them the royal trea­sury, governmental archives, a printing press, and several libraries which would form the basis of the National Library in Rio de Janeiro. "Shortly after he arrived, and still during his brief stay in Salvador, on 28 January 1808 Dom João opened Brazil's ports to friendly nations. Even if one acknowledges that at that time 'friendly nations' meant Great Britain, Dom João's decree put an end to a 300-year-old colonial system. 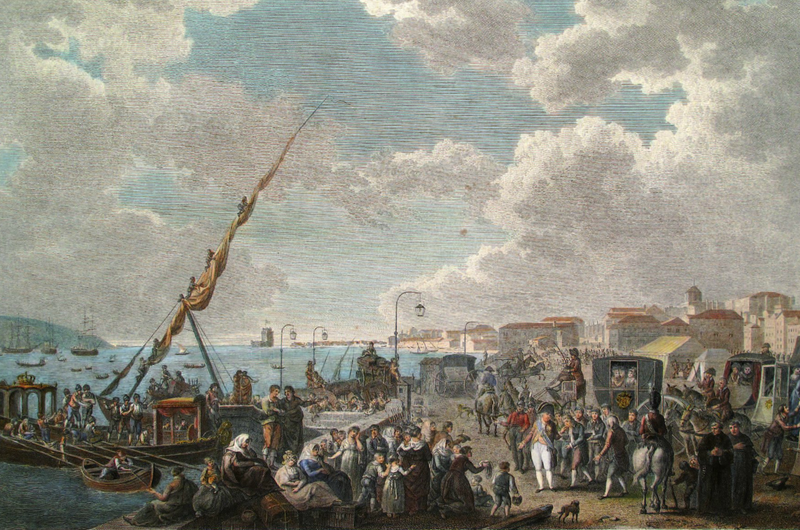 In April 1808, having reached Rio de Janeiro, the prince regent revoked decrees that prohibited setting up factories in Brazil. He exempted from tariffs those raw materials imported for industrial purposes. He offered subsidies to the wool, silk, and iron industries. And he encouraged the invention and introduction of new machinery. "The opening of the ports was a historically predictable act, but was triggered by the circumstances at hand. Portugal had been taken over by French troops so no business could be done there. As far as the crown was concerned, it was preferable to legalize the already existing contraband between Britain and Brazil so the government could collect tariffs. "Great Britain was the chief beneficiary of this measure. Rio de Janeiro became the port of entry for British manufactured products­ -- not only for Brazil, but also for the River Plate region and the Pacific coast of South America. By August 1808, there was a nucleus of between 150 and 200 British merchants and commercial agents in Rio. The opening of the ports also favored rural land-owners growing export crops, mainly sugar and cotton. This freed them from the metropolis's commercial monopoly. From then on, they would be able to sell to whomever they pleased, with no more restrictions imposed on them by the colonial system. "The arrival of the royal family was the final step in the trans­feral of the colony's administrative axis to Rio de Janeiro. It also changed the face of the city. Some of the changes included an incip­ient culture. Books became available and, relatively speaking, ideas began to circulate. In September 1808 the first colonial newspa­per started publishing. Theaters and libraries also opened. Literary and scientific academies attended to the needs of the court and of a rapidly expanding urban population. During Dom João VI's stay in Brazil (1808-1821), Rio's population doubled, going from 50,000 to 100,000 people. Many of the new inhabitants were immi­grants -- and not just Portuguese, but also Spaniards, French, and Britons who would become middle-class professionals and skilled artisans. "In addition, scientists and foreign travelers came to Brazil. Among them were John Mawe, an English naturalist and mineralogist; the Bavarian zoologist Johann Baptist von Spix; Karl Friedrich Philipp van Martius, a Bavarian botanist; and the French naturalist Étienne Geoffroy Saint-Hilaire. Their works are indispensable for understanding the early 19th century. In March 1816, a French artistic mission reached Rio de Janeiro. With it came the painters Félix Émily Taunay and Jean Baptiste Debret and the architect Grandjean de Montigny, who designed urban buildings. Taunay and Debret left behind sketches and watercolors depicting landscapes and cus­toms in Rio de Janeiro."